Available to download for free, the Internet Channel brings the web to your TV and makes surfing a social experience! With the Internet Channel, you can quickly look up something that caught your attention on a TV programme or have the whole family get together in front of the TV to plan your next getaway. It's also a great way to watch funny online videos together with friends, as others in the room can use extra Wii Remotes to point out things that catch their eye. The fast-booting Internet browser will create a new relationship between the family, the TV and the Internet. This Channel uses the full Internet browser from Opera Software, which also supports Adobe Flash. 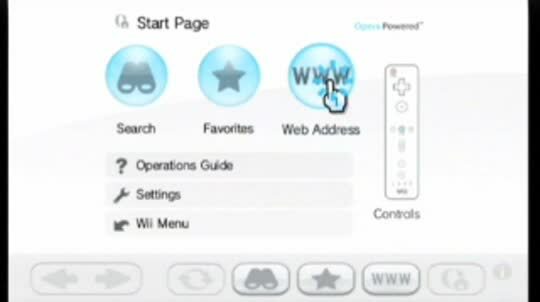 Zoom in and out of the page you are looking at by pressing the + and – Buttons on the Wii Remote and scroll by holding the B Button and pointing in the direction you want the page to move. Pressing the 1 Button will hide the navigation bar and give you a full-screen view of the page you are visiting. Whenever you’re entering a web address or searching for a keyword, you can switch the auto-fill function on or off by pointing at the arrow icon below the text box and pressing the A Button. Enter the ‘Settings’ menu to alter your display options and decide which search engine you want to use as your default.